I began thinking about someday owning my own alpacas after John and I went to an alpaca farm / yarn shop while visiting my parents in Wimberley, TX. In this shop, they sold yarn spun from specific alpacas and each skein came with a little card of information about that alpaca. Yes, the yarn was lovely and soft, but it was actually those silly little cards and knowing the alpaca’s name that made me buy the yarn. The Natural Knitter by Barbara Albright — I own this one and love it. Each fiber discussed is accompanied by a project that works well with it and the book has gorgeous full-color photos from cover to cover. The Knitter’s Book of Yarn by Clara Parkes — This is one of the first fiber books I checked out from the library and it is JAM PACKED with information and super cute illustrations of animals. Spinner’s Book of Fleece by Beth Smith — This one is only about sheep, but goes into great detail about many breeds of sheep and each breed is accompanied by knitted swatches of hand spun yarn made from that fleece. It’s a great way to visualize the differences between the different breeds. I found Spinner’s Book of Fleece interesting because of the sheep and how each fleece could be so different. Spinning was on a list of things that I’d do if the opportunity ever arose but I wasn’t really looking to buy new gadgets for yet another hobby. …And I already have enough yarn to last a lifetime. When we helped out at Evan’s Knob Farm a couple of weeks ago, that opportunity to learn how to spin did arise. Kathy, the farm’s overlord (hehe), let me pick out some roving she had created from her flock of sheep and sat me down at her spinning wheel. That first night of spinning was a bit frustrating, but I kept at it for hours until it finally clicked. And then I went back to it another night and finished this kinda gnarly but in its own way lovely skein of yarn. After earning my “Hand Spinning Newbie” badge and my “Sort of Helped Shear a Sheep” badge, Kathy sent me home with a big bag of fleece! When I got home, I ordered a drop spindle and some hand carders from The Woolery (these were a lot more pricey than I was expecting but I couldn’t find many cheaper hand carders on the web that didn’t look like someone had grabbed dog brushes and attempted to market them as hand carders). My first time using hand carders. Look at those fluffy fibers! The carders worked well, and I think I got the hang of carding pretty quickly. 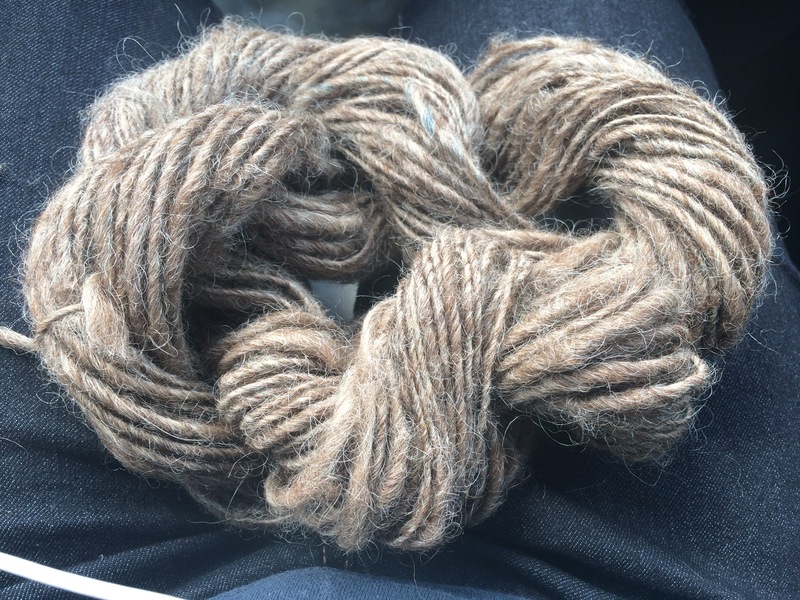 I carded 5 or 6 little batches and rolled them up into rolags. Then I had to figure out how to use a top whorl drop spindle… Nothing that a little Googling couldn’t fix. I spent about two hours spinning the bits of wool that I’d carded. A little slow, but I still enjoyed it. Two hours worth of yarn… phew! I need to remember to put a cloth or something over my clothes the next time I spin. All of those little sheep fibers cling to my clothes! 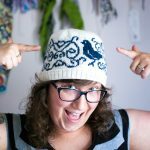 If you’ve been into yarny crafts for a while but have never tried spinning, I’d suggest giving it a try. There’s a little learning curve but it’s no worse than the one for knitting or crocheting. Unless you buy fleece, you’ll only need a drop spindle (mine came with a niddy noddy and was less than $20 for both) and some roving to play with. Let me know if you decide to try it! I’d love to see your first attempts!